Your teeth do more than give you a sparkling smile. They grind up food so you can eat it. Imagine trying to eat an apple without chewing it up first. Those big, hard lumps of fruit would hurt going down. Yes, teeth are marvelous equipment, but you have to take care of them. 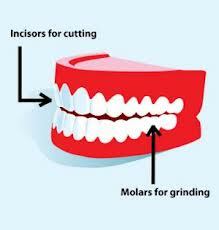 All About Your Teeth: The incisors include your front top and bottom teeth. The molars are the flat back teeth. You have three kinds of teeth in your mouth. The incisors include your front top and bottom teeth. These teeth are wide and sharp. They help you bite off food. Your canine teeth are the sharp, pointed teeth next to the incisors. These teeth help you rip and tear food. The molars are the flat back teeth. These teeth smash and grind food so you can swallow it. Classification of Human Teeth in Detail. Saliva glands make saliva, or spit. Saliva mixes with your food to make it soft and wet. The outside of your teeth are covered with enamel. Enamel is hard. Inside your teeth are blood vessels and nerves. A newborn baby has teeth in her gums. The teeth appear in her mouth when she is about six months old. Young children have 20 baby or milk teeth. Most kids start losing their baby teeth when they’re about six years old. Brushing and flossing your teeth everyday keeps them clean and healthy. A video explaining the types of teeth, their functions and main parts. Question: How many teeth do adults have? Answer: Adults usually have 32 teeth, which includes four back teeth called wisdom teeth. These teeth might not ever grow. Sometimes the wisdom teeth are removed. Question: Why is it important to take care of my teeth? Answer: Brushing and flossing your teeth everyday keeps them clean and healthy. It also keeps your whole body healthy, because gum disease can cause other problems. 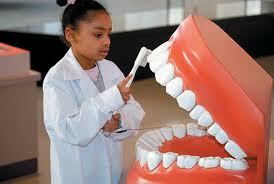 Enjoyed the Easy Science for Kids Website all about Your Teeth info? Take the FREE & fun Your Teeth quiz and download FREE Your Teeth worksheet for kids. For lengthy info click here. Declan, Tobin. " Fun Teeth Facts for Kids ." Easy Science for Kids, Apr 2019. Web. 21 Apr 2019. < https://easyscienceforkids.com/all-about-your-teeth/ >.